Jacobs Audiology offers a full range of high-quality audiological services for adults and children of all ages. We know you have lots of questions when it comes to hearing loss and treatments and we have the knowledge and guidance to help patients in suburban DC and Southern Maryland improve their hearing health. Here are just a few resources to help you learn more. For further information or to make an appointment, contact our Bowie location at 301-860-1124 or our Lexington Park location at 410-535-0024. It may seem as if there’s a lot to learn about hearing and hearing aids. 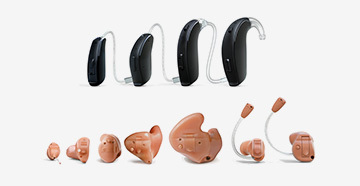 Jacobs Audiology offers a downloadable consumer’s guide to hearing aids to provide you with valuable, easy-to-read information to find out more about the different types of hearing aids and which may be right for you. We provide a hearing healthcare video library to educate you on hearing aids and hearing aid maintenance. When sound waves enter the ear canal, the waves cause the eardrum to vibrate. This vibration causes tiny bones in the middle ear to move (hammer, anvil, stirrup). As the sound progresses along the chain of bones, it moves to the inner ear (cochlea) and fluid in the cochlea moves. Nerves then send the sound to the brain. Find out more here. Did you know that there are three types of hearing loss? They are sensorineural hearing loss, conductive hearing loss and mixed hearing loss. Sensorineural hearing loss occurs when there is a problem with the cochlea of the inner ear. Conductive hearing loss may be due to a blockage in the ear canal, an injury, infection or fluid in the ear and may be temporary or permanent. Mixed hearing loss is a combination of sensorineural and conductive hearing loss. Learn more here. We are proud to be able to offer financing through a stable and experienced company like Wells Fargo. The Wells Fargo Health Advantage® credit card program offers a comprehensive range of financing options.